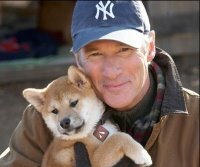 Hachiko: A Dog’s Tale is coming to movie theaters on December 18, 2009. For those who aren’t familiar with the story, Hachiko was an Akita puppy who was owned by a Tokyo University professor in the early 1920s. A special bond formed between them, the sort of bond that Akita dogs are known for. Each morning, the dog walked with the professor to the train station in Shibuya, now a crowded neighborhood of Tokyo. Each afternoon, the dog would return to meet the 4 o’clock train, knowing his owner would be on it. When the professor had a stroke at work, and later died, the dog continued to return to the train station, every day at 4 o’clock, for the next nine years. As the years passed, newspaper accounts were written about Hachiko, postcards of the aging dog and other souvenirs were sold at the train station, and a bronze sculpture was erected while the real dog was still alive to pose nearby. Tourists began gathering there (it is still a popular gathering spot in Tokyo), a Hachiko fanclub was established, and soon afterward the ministry of education had a song written, Chu-ken Hachi-ko, or “Loyal Hachiko,” which was taught to schoolchildren nationwide as a lesson in the importance of loyalty. Morie Sawataishi, the hero of my book Dog Man, was just a schoolboy growing up in the far north of Japan, the snow country, when he was taught the song about Hachiko, and told the story of the famous dog. Years later, his memory of the story led him to illegally hide an Akita puppy through-out World War II, feeding it and keeping it alive, when food was hard to come by and even his own family members were hungry. For Morie, the Akita dog stood for something honorable and important, a part of old Japan that was vanishing. Morie thought about the value of that kind of loyalty and faithfulness, and the preciousness of it. Who would be loyal as an Akita if there weren’t any Akitas left?